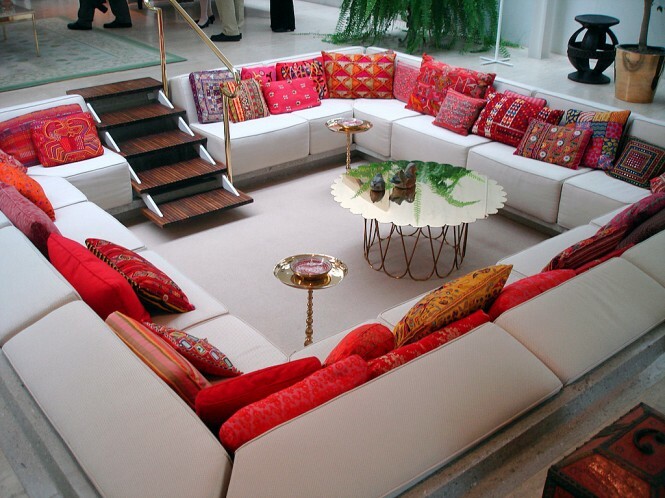 Every living room needs a conversation area, no matter the shape or size of your living room. 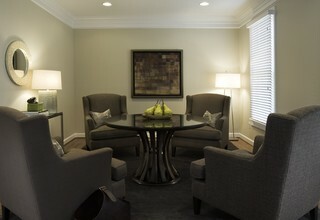 This page shows you how to plan a comfortable and welcoming conversation area. We humans are social creatures – it’s good to talk, to share life’s highs and lows, thoughts and ideas with those we know and love. It's part of my series of pages on living room design. 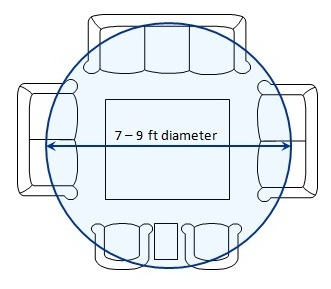 The maximum comfortable distance for a seated conversation between people’s heads is between 7ft and 9ft (about 2.1m to 2.8m). Any bigger than this and you'll start wanting to raise your voice and it becomes harder to pick up on facial cues. Bear in mind this is the maximum distance which applies when you want to fit the maximum amount of people in. When we’re talking in smaller groups it’s nice to be a bit closer. And of course there’s the coffee table. 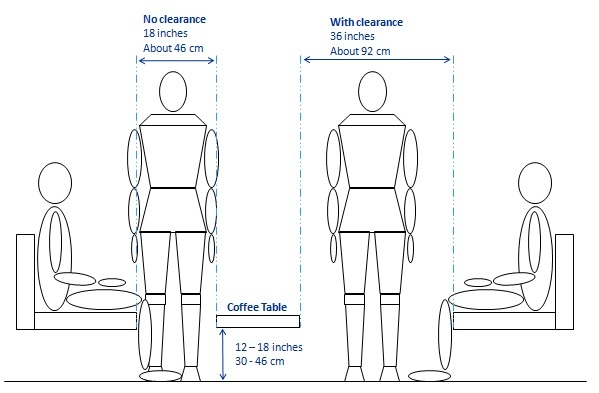 The coffee table should be 12-18 inches (30 – 46cm) high. The distance between the seat of the sofa and the coffee table should be 18 inches (about 46cm) where no circulation is required between the sofa and the coffee table and 36 inches (92cm) when there does need to be room for someone to pass. How many people can you fit on a sofa? The average person takes up 2ft of sofa length but that all depends on how well your guests know each other. A family of 2 adults and 4 small kids might find themselves occupying a three-seater sofa quite cozily and comfortably! 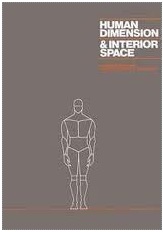 You can find out lots of useful interior space dimensions by getting yourself a copy of Human Dimension and Interior Space. If you enjoy messing around with layouts and floor plans then this book is essential for finding out what size everything should be, and also what space needs to left in between pieces of furniture. Wondering how many people you can fit in your dining room? 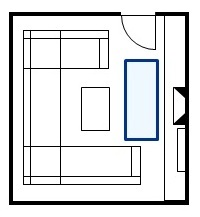 Want to know the minimum size for a half bath? This book has the answers. When it comes to living room layout, for most of us the reality is that the main conversation area is in the same space as a TV, and maybe a fireplace as well. What this means is that there’s only 3 sides of the square (or ¾ of the circle) available for permanent seating (by that I mean seating that’s there all the time). So for the times when TV is off and the area is used for conversation here’s a few tips to get back the 4th side of the conversation area. 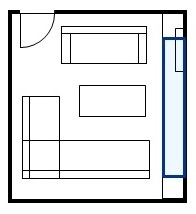 Usually the rule is to keep circulation areas clear but when you’re in the situation where you need to use occasional additional seating then using the circulation space as shown in the blue square can add to the atmosphere. 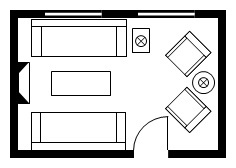 In this living room layout the TV is mounted on a wall bracket. When it's not being used it can be pushed flat against the wall, out of the way. The boxes (DVD, PS/3, Tivo etc how many have you got?) are stored in a low unit that runs the length of the wall which can be used as a seat if necessary. 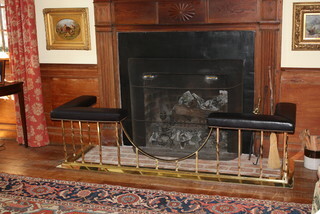 If you have a fireplace, a fender is a great option (great for fire safety too). They’re not super comfortable but they’re a convenient perch if all your other seats are taken - if a bit hot when the fire is on! If you have more people you can always add to the everyday seating. When I’m hosting book club I bring in our dining room chairs into the living room to make up enough seating. Dining chairs are great for this because they’re smaller than other living room seating. Another option is to have furniture in the living room that can do double duty. Side tables can become seats if they’re sturdy enough (provided that there’s still somewhere for people to put their drinks). Footstools are great for perching on as well. A friend of mine has several low stools which she stores under the coffee table for when she has a full house. If you think about life, the most important conversation happens between two people –generally with your partner and other members of your family. I think it’s nice to have a special space for this. It means there’s a space away from the TV where you can sit to talk – about everyday things or about the more serious stuff. Small seating areas are also a great place to be with yourself for a while. If you have room for a dedicated conversation area – that is a space where the main use is as a conversation area (and not watching TV) you have some really interesting possibilities. A great way to dream up a design for a dedicated conversation area is to think about your favorite hotel lobby or bar or night club and scale it appropriately for the space you have available. 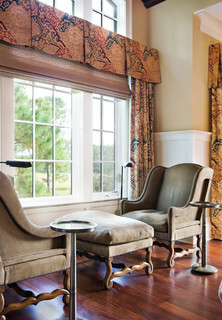 When you’re choosing furniture for your dedicated seating areas think about the atmosphere you’re trying to create. You’re not restricted to sofas suitable for TV watching. You might want to create something a bit more ‘coffee shop’ with slightly higher chairs and table.